Alke Brinkmann was born1967 in Saarbruecken, Germany. She grew up in Switzerland, Canada the USA and in southern Germany. She lived and worked in Berlin since 1988.The Berlin Artist mixes paintings of varying formats and styles to present room-filling installation. Emotive communication between the painted image and the observer is what Alke Brinkman calls her artistic exploration, a communication that lies underneath the level of information as if subcutaneous and which points to the painted image. She was inspired by Edouard Manet, Berthe Morisot, Adolph Menzel, Gerhard Richter, Jean-Michel Basquiat, Peter Doig, Marlene Dumas and others. 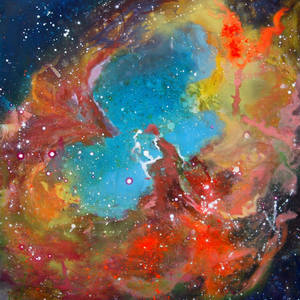 Exploring landscape painting to its origins in the universe is her actual topic. Her recent paintings are inspired by Rupert Sheldrake, Fritjof Capra, Stephen Johnson and the biologists of the Humboldt University in Berlin.